MANHATTAN BEACH, CA – February 10, 2009 – For over 14 years Polyfab Australia has been supplying quality knitted shadecloth for Architec shade sails and tension membrane structures in the commercial and residential markets. Until 2008 they distributed their fabric in North America through independent distribution. In order to enhance customer service and bring inventory closer to the shade fabricator “It is a good time to expand”, according to the Company Director, Barry Jamieson. Even in this economic downturn, planned infrastructure investment for new schools and public buildings will increase demand for shade structures to protect people from excessive UV exposure. 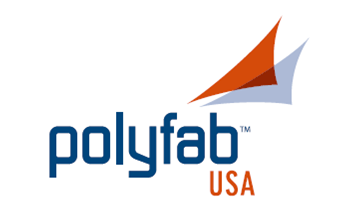 And the fact that Polyfab’s products are fire rated increase the likelihood they will be specified in new construction-especially government-funded projects. Mr. Jamieson talked with many of his US customers about opening up another sales and warehousing location to add to the worldwide reach of Polyfab. “We like your fabric,” they told him, “but we want domestic stock and a company representative dedicated to our business.” So the decision was made to establish a stocking location in Southern California. “Fabric will be stocked in the Los Angeles area”, says the new National Sales & Marketing Manager, Steve Morenberg “and be available within one or two days from our customer base in the Southwest US. National distribution by TriVantage ensures that every fabricator in the country has easy access to this product”. Morenberg has over 30 years of experience in the industrial fabrics market, having worked in distribution and manufacturing sales for The Astrup Company, Unitex and Reeves Brothers (Trelleborg Coated Systems). The initial product mix will include both Polytex® and Comtex®. Polytex® is a superior fire rated knitted HDPE shade fabric designed for use in modular Architec shade structures and shade sails. Comtex® is a superior fire rated knitted HDPE shade fabric designed for large tension membrane structures and architectural shade sails. Both lines are compliant with the Fire Standards of NFPA 701-99, ASTM E-84 Class A and California State Fire Marshal Section 13115; are available in 13 colors; put up on 12.5 foot by 100 foot center folded rolls and are covered under Polyfab’s 10 year UV warranty.